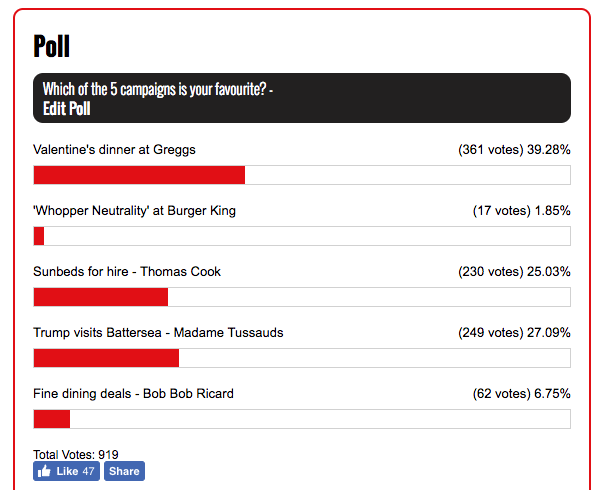 A mouthwatering contest between PRWeek's five favourite campaigns in January was won by Greggs, with its Valentine's dinner offer receiving 361 of the overall votes. PR agency Taylor Herring helped the popular high-street baker gain widespread coverage for the campaign. In second place, with nearly 250 votes, was Madame Tussauds and Stripe Communications' quick-thinking Donald Trump stunt; and, in a close third, agency Good Relations and Thomas Cook hitting the headlines with its 'Choose Your Favourite Sunbed' campaign. With all the buzz around Valentine’s Day it can be hard for campaigns to stand out. Not so for Greggs, which has teamed up with OpenTable to offer couples a unique date experience on the 14 February. Participating couples will get roses, candlelight, four-course dining, and even table service, the baker announced this week. And the food? Greggs classics with a date-night twist. The campaign has been wildly successful. Only available at five branches, local coverage in Manchester, London, Glasgow, Cardiff and Newcastle has been widespread. It has been covered in the nationals, too – getting stories everywhere from the Independent and ITV.com to the Sun. It's even captured financial journalists' hearts, with the Mirror Money team pointing out that you can get your Valentine’s Day dinner complete with pudding and prosecco for just £15. A real match made in heaven for PR agency Taylor Herring.